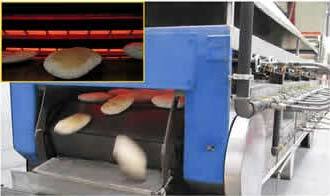 When Pittas Bakery in Rotherham wanted a cost effective, superior alternative to their existing electric oven and specialist gas burner, Sheffield manufacturers Infraglo had just the solution they were looking for. With the UK's largest range of gas fired radiant burners and heaters the answer was obvious: to refit the principal oven with 14 Infraglo Supersaver infrared burners. Savings of 80% per year can be expected from the Supersaver range and the newly revamped oven has been impressing it's delighted owner. "The changeover to gas made perfect business sense, in the coming months I am guaranteed that my running costs will decrease dramatically", said Tasos Loucas, Director of Pittas Bakery. The conversion to Supersaver burners each with its own individual gas control means every single burner can be turned on and off as required. "Before we had difficulties controlling the temperature of the oven so at times the bread was slightly over cooked on one side, being able to turn off an individual burner means the overall quality of the product is better." Tasos explained. Infraglo's burners can be installed in other catering equipment including grills, rotisseries, frying ranges, boiling units and naan bread ovens. In a competitive market, where high quality product output is paramount to caterers, Infraglo are setting a precedent in the field of gas conversions without compromising the quality of the product. In a competitive market, where high quality product output is paramount to caterers, Infraglo are setting a precedent in the field of gas conversions without compromising the quality of the product.